Advanced wastewater-treatment techniques such as adsorption are essential in the removal of non-biodegradable toxic wastes from water. In this study, the use of South African coal fly ash, an industrial byproduct, has been investigated as a potential replacement for the current costly adsorbents used for removing heavy metals from wastewater. We utilised coal fly ash for the adsorption of cobalt(II) ions from synthetic petrochemical wastewater and characterised its performance. A two-level three-factor full-factorial design was successfully employed for experimental design and analysis of the results. The combined effects of pH, initial concentration and adsorbent dose on cobalt(II) removal were assessed using response surface methodology. Although the focus was on removal of cobalt(II), the adsorption was carried out in the presence of phenol and other heavy metal ions using the batch technique. The applicability of the Freundlich and Langmuir models to the equilibrium data was tested. 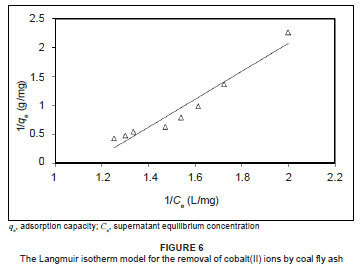 Consequently, the equilibrium data was found to conform more favourably to the Freundlich isotherm than to the Langmuir isotherm; in this case, the coal fly ash had a maximum adsorption capacity of 0.401 mg/g for cobalt(II). We conclude that South African coal fly ash, as a natural, abundant and low-cost adsorbent, might be a suitable local alternative for elimination of cobalt(II) from aqueous solutions. The removal of recalcitrant contaminants, such as cobalt, from wastewater is essential as they pose a serious health and environmental hazard. Severe effects of acute cobalt poisoning in humans include asthmatic symptoms and damage to the heart, thyroid and liver. At elevated concentrations, cobalt may also cause genetic mutations in living cells, emphasising the need to increase awareness of the problems associated with cobalt poisoning. Current studies related to the method of removing cobalt from wastewater have drawn broad interest and show that cobalt removal from wastewater cannot be adequately achieved using secondary adsorption methods.1 Thus advanced wastewater-treatment methods, such as ion exchange,2 precipitation,3 membrane separation4 and electrolysis,5 must be used to remove recalcitrant waste such as cobalt. However, most of these methods are costly and require high levels of expertise; consequently, these methods are not applied by many end-users. For these reasons, adsorption technology has gained a wider application due to its inherent low cost, simplicity, versatility and robustness. The success of an adsorption process starts with choosing the appropriate adsorbent. Several adsorbents can be used to treat industrial wastewater, namely commercial activated carbon, zeolites, silica gel and activated alumina. Unfortunately, these adsorption media are relatively costly. For this reason, the use of low-cost adsorbents derived from industrial solid waste has attracted wide attention in recent years. Such waste materials currently are underutilised, which avails them for use as adsorbents. For example, 28 million tonnes of coal fly ash, a micro-spherical particulate byproduct of high-ash content coal combustion for power generation,6 is produced annually in South Africa.7 Merely 5% of the coal fly ash is used as a construction material while the rest is stored in ash dumps that have to be rehabilitated, which results in an increase in the cost of ash handling.8 This coal fly ash has a high unburned carbon content and thus cannot be used as a cement additive because of the adverse effects of the carbon on the quality of concrete.9 Other avenues for the utilisation of the vast amounts of unused coal fly ash are therefore open for investigation. The use of coal fly ash as an alternative to costly adsorbents could benefit developing countries such as South Africa. The limitations of traditional methods such as the OFAT method can be eliminated by optimising all the affecting parameters collectively by statistical experimental designs such as response surface methodology (RSM).12 RSM is a collection of mathematical and statistical techniques useful for developing, improving and optimising a process and can be used to evaluate the relative significance of several affecting factors even in the presence of complex interactions. The main objective of RSM is to determine the optimum operational conditions for the system or to determine a domain that satisfies the operating specifications. The application of statistical experimental design techniques in the development of the adsorption process can result in reduced process variability and overall costs.13 However, RSM has not been used for the optimisation of the removal of cobalt(II) from petrochemical wastewater using coal fly ash. The objectives of the present study were to investigate the feasibility of using South African coal fly ash for the removal of cobalt(II) from synthetic petrochemical wastewater, to model the adsorption process of cobalt(II) and to investigate the interactive effects of process parameters such as adsorbent dose, solution pH and initial concentration on the adsorption capacity of coal fly ash towards cobalt(II) ions using response surface methodology. The synthetic petrochemical wastewater used in this study contained phenol and the heavy metals cobalt, nickel, iron and lead. However, in this paper, we present only the adsorption results of cobalt(II). Stock solutions (1000 mg/L) of cobalt(II), nickel(II), iron(II), lead(II) and phenol were prepared by dissolving 4.94 g of Co(NO3)2·6H2O, 4.48 g of NiSO4·6H2O, 4.98 g of FeSO4·7H2O, 1.60 g of Pb(NO3)2 and 1.00 g of C6H5OH, respectively, in 1 L of distilled water. The stock solutions were diluted with distilled water to obtain the desired initial concentration according to the levels specified in Table 1. The composition of the synthetic aqueous solutions used in this study were based on those used previously15 and concentrations were within the range of the typical petrochemical wastewater described in the Pollution Prevention and Abatement Handbook,16 which specifies that the phenol concentration range is 20 mg/L - 200 mg/L and the range for heavy metals is 0.1 mg/L - 100 mg/L. The pH of the solutions was adjusted using either dilute HCl or NaOH. A maximum pH of 6, which is below the pH point of precipitation (pHppt) for each of the metal ions, was chosen to prevent possible metal hydroxide precipitation.17 All the pH measurements were carried out using a pH meter (LabX Direct-SevenMulti, Mettler Toledo, Columbus, OH, USA) and all the chemicals used were of analytical grade and supplied by Merck Chemicals (Johannesburg, South Africa). where xi is the independent variable coded value, Xi is the independent variable real value, Xo is the independent variable real value on the centre point and ΔX is the step change value.12 Table 1 gives the range and the levels of the variables (i.e. low and high) investigated in this study. 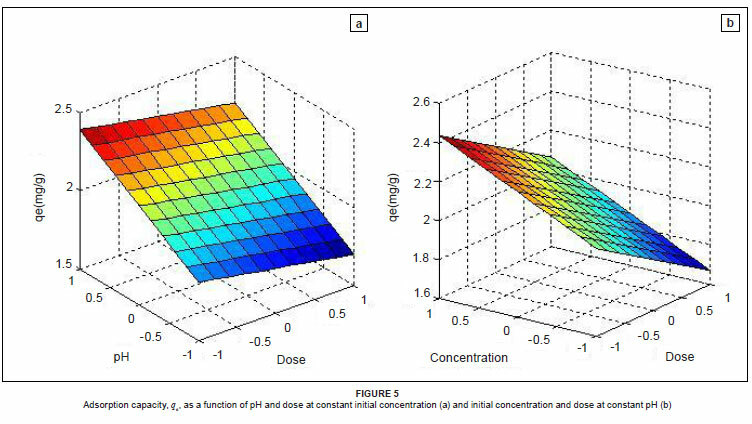 where y is the response predicted by the model and x1, x2 and x3 are the coded forms of dose, pH and initial concentration, respectively. The term βo is the offset term, β1, β2 and β3 are linear terms, β11, β22 and β33 are the quadratic terms and β12, β13 and β23 are the interaction terms. An analysis of variance (ANOVA) was performed to establish statistical significance for the quadratic model. Design Expert Version 6.0.6 (Stat-Ease Inc. in Minneapolis, USA) and Matlab Version 7.0.1 (MathWorks in Natick, Massachusetts) were used for regression and graphical analyses of the data obtained. The statistical significance of the regression coefficients was determined by the Student's t-test and p < 0.05 was considered significant. where Co and Ce are the initial and equilibrium adsorbate concentrations in solution (mg/L), respectively, V is a known volume of synthetic wastewater (L), and m is a known mass of dry coal fly ash (g). To optimise the design of an adsorption system for the removal of adsorbate, it is important to obtain the equilibrium adsorption data. Thus the equilibrium adsorption isotherm data was generated by contacting a fixed amount of coal fly ash with 100 mL of synthetic petrochemical wastewater, in which the concentration of metal ions and phenol ranged from 20 mg/L to 90 mg/L, at a pH of 4.0 in 250-mL Erlenmeyer flasks. Coal fly ash was separated from the solution after 4 h and the residual cobalt(II) ion concentration in the solution was measured. 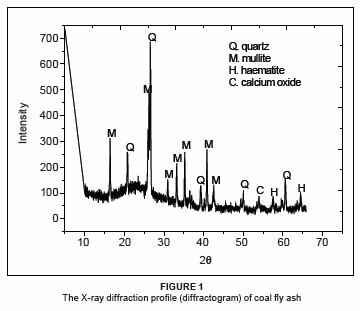 The FTIR spectrum (Figure 2) shows the functional groups that are on the surface of coal fly ash. However, the availability of a particular functional group or binding site does not necessarily guarantee its accessibility as an adsorption site for a metal ion, because of the presence of steric, conformational or other types of barriers. The spectrum displays a number of absorption peaks, of which the band appearing at 1059.0 cm-1 is associated with X-O (X = Si, Al) asymmetric stretching vibrations.6 Peaks at 1975.7 cm-1 and 2363.7 cm-1 could be attributed to C=O and alkyl groups, respectively, that are present in the clay material of the coal fly ash. The band appearing at 555.9 cm-1 is associated with the octahedral aluminium present in mullite. In addition, bands appearing between 800 cm-1 and 600 cm-1 are associated with the tetrahedral vibrations formed by what are known as secondary building units and fragments of the aluminosilicate system. These bands are characteristic of the double or single rings (depending on the structure of the material) and/or the XO4 (X = Si, Al) tetrahedral bonds.21 By comparing the spectra before and after adsorption, it becomes clear that the bands before adsorption at 2530.8 cm-1, 2160.5 cm-1, 2028.5 cm-1, 1975.7 cm-1 and 1059.0 cm-1 shifted after adsorption to 2600.0 cm-1, 2175.7 cm-1, 2036.8 cm-1, 1965.4 cm-1 and 1043.5 cm-1, respectively. A shift in all the bands indicates that all functional groups were involved in the adsorption process. Figure 3 shows the SEM images of coal fly ash before and after adsorption. These images reveal that the raw coal fly ash, that is the coal fly ash before adsorption, mainly consists of well-developed, smooth, glassy spherical particles (cenospheres) and some irregular-shaped particles interspersed with aggregates of crystalline compounds, which likely correspond to quartz and haematite. Furthermore, the SEM images show low pore development in the coal fly ash. 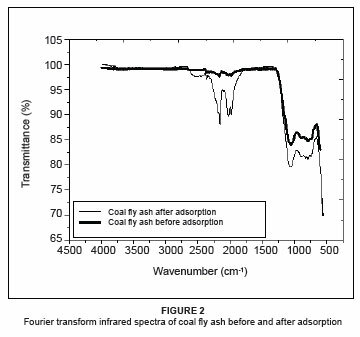 These results are comparable with those reported by El-Naggar et al.6 Comparing raw coal fly ash (Figures 3a and 3b) with coal fly ash after adsorption (Figures 3c and 3d), it can be seen that there are morphological changes in the coal fly ash during adsorption. After adsorption, the spheres of coal fly ash were covered by precipitates and complexes formed by the heavy metal ions; similar observations were made by Mohan and Gandhimathi19. The textural characteristics and pore structure of coal fly ash are presented in Table 3. The low surface area of coal fly ash is consistent with the SEM images in Figure 3 which show low pore development in coal fly ash. Bayat22 analysed two different Turkish fly ash samples and observed SBET values of less than 0.342 m2/g, even lower than those for South African coal fly ash; however, the performance of the two Turkish samples as adsorbents was favourable. 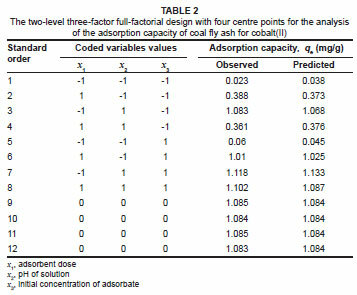 The optimum adsorbent dose was determined by shaking a series of 250-mL flasks containing wastewater with different doses of coal fly ash, varying from 2 g/L to 60 g/L for 4 h. All other factors were kept constant for each flask, according to the zero-level composition shown in Table 1 (i.e. pH = 4, temperature = 25 ºC, shaking speed = 250 rpm, cobalt = 50 mg/L, other heavy metals = 50 mg/L and phenol = 110 mg/L). 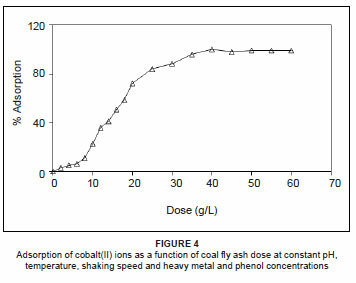 It is observed from Figure 4 that, as the dose of coal fly ash increases, the percentage of cobalt(II) adsorbed increases and reaches a maximum value corresponding to a certain adsorbent dose, above which adsorption will not increase with an increase in adsorbent dose. The minimum adsorbent dose corresponding to the maximum adsorption (100%) is the optimum dose. Thus, it is evident that for the quantitative removal of cobalt(II), the optimum dose of coal fly ash is 40 g/L. where x1, x2 and x3 are the coded values of the test variables, dose (g/L), pH and initial concentration (mg/L), respectively. The statistical significance of the second order model equation was evaluated using Fisher's F-test and an ANOVA and acceptance of the model was made on the basis of a 95% confidence level.23 Based on probability values less than 0.05, statistical significance was indicated for the model, as well as for the model terms (x1, x2 and x3) and the interactions between dose and pH (x1x2) and between dose and initial concentration (x1x3). The interaction between pH and initial concentration (x2x3) was not statistically significant. For a model to be reliable, the response should be predicted with reasonable accuracy when compared with the experimental data. In this case, there was a high correlation coefficient (R2 = 0.9991) between the predicted values and the real values obtained from the experimental data. 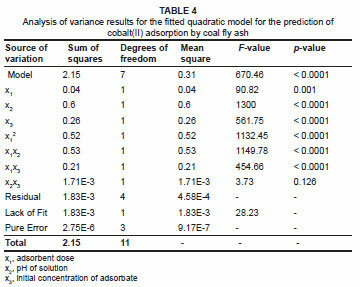 Figure 5 shows the three-dimensional response surface plots that are graphical representations of the regression equation, from which the adsorption capacity for different levels of the variables can be predicted. Each response plot represents an infinite number of combinations of two test variables, with the other variable maintained at a constant level. Other solid materials, such as Fe2O3, exhibit similar patterns in developing positive and negative charges depending on pH.22 At a low pH (i.e. below 2.2, the pHpzc for silica), a positive charge develops on the surface of the coal fly ash resulting in poor adsorption of the metal ions because of repulsion. At pH values above 2.2, the surface of coal fly ash is negatively charged and becomes more negatively charged as the pH increases; the enhanced favourable electrostatic forces results in increased removal of the metal ions. Ricou-Hoeffer et al.25 reported that aluminosilicate compounds in coal fly ash may also be involved in adsorption of metallic ions. The decrease in adsorption capacity of coal fly ash with an increase in adsorbent dose, could be because of aggregation or overlapping of adsorption sites caused by overcrowding of coal fly ash particles, which results in a decrease in total adsorbent surface available to the metal ions. Particle interaction may also desorb some of the sorbate that is loosely and reversibly bound to the coal fly ash surface.26 Therefore, at high adsorbent doses, some adsorption sites remain unsaturated during the adsorption process because they are not accessible. The relationship between adsorption capacity, dose and initial concentration of cobalt(II) at a constant pH is shown in Figure 5b. It is apparent that the adsorption capacity of coal fly ash increased by increasing the initial concentration and decreasing the adsorbent dose. An increase in cobalt(II) adsorption by increasing the initial concentration is a result of the increase in the driving force of the concentration gradient and not as a direct result of an increase in the initial cobalt(II) ion concentration.27,28 Under the same conditions, a higher concentration of cobalt(II) ions present in the solution would cause the active sites of coal fly ash to be surrounded by more cobalt(II) ions; this adsorption process would therefore be carried out more effectively.27 Adsorption capacity is therefore increased by increasing the initial cobalt(II) ion concentration. The combined effects of solution pH and initial cobalt(II) ion concentration were analysed and it was found that both parameters have an impact on the adsorption capacity of coal fly ash. The model predicted that adsorption of cobalt(II) would increase by increasing the pH and the initial concentration (figure not shown). This prediction is consistent with the experimental results shown in Table 2, wherein the highest adsorption capacities (1.118 mg/g and 1.102 mg/g) were both observed at high pH and high initial concentration (run orders 7 and 8). Analysis of the adsorption isotherm data is important to develop an equation which accurately represents the results, which could be used for design purposes and which will optimise an operating procedure. Other researchers in the field of environmental engineering29,30 have used Freundlich and Langmuir isotherm equations to represent equilibrium adsorption data despite the fact that these equations have serious limitations on their usage.28 Simplicity and easy interpretability are some of the reasons which would account for the extensive use of these models. 	the adsorbed molecule cannot migrate across the surface or interact with neighbouring molecules. where qe is the adsorption capacity at equilibrium (mg/g), qmax is the theoretical maximum adsorption capacity of the adsorbent (mg/g), KL is the Langmuir affinity constant (L/mg) and Ce is the supernatant equilibrium concentration of the system (mg/L). The Langmuir constants are predicted from the plot of 1/qe versus 1/Ce which is shown in Figure 6 for cobalt(II) removal using coal fly ash. From this plot, the maximum adsorption capacity is 0.401 mg/g, the Langmuir affinity constant is 1.000 L/mg and the correlation coefficient is 0.9390. The plot of log qe versus log Ce has a slope with the value of 1/n and an intercept magnitude of log KF. On average, a favourable adsorption tends to have a Freundlich constant, n, between 1 and 10. A larger value of n (i.e. 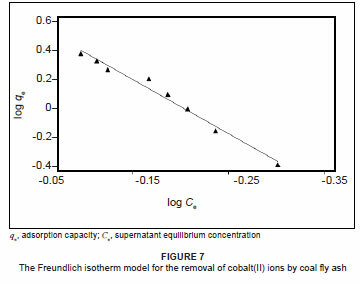 a smaller value of 1/n) implies a stronger interaction between the adsorbent and the adsorbate.33 Figure 7 provides results on Freundlich isotherm fittings for the removal of cobalt(II) by coal fly ash. The Freundlich constants, i.e. KF and n, were found to be 5.611 mg/g and 0.276 mg/g, respectively. The correlation coefficient was higher (R2 = 0.9810) than that obtained for the Langmuir isotherm (R2 = 0.9390), indicating the applicability of the Freundlich isotherm to the adsorption data. This observation is consistent with the heterogeneous nature of coal fly ash, that is the presence of different groups of surface adsorption sites such as ≡SiOH and ≡FeOH. Similar observations were reported by Cho et al.9 for the adsorption of zinc, lead, cadmium and copper using coal fly ash. South African coal fly ash was used successfully to remove cobalt(II) ions from synthetic petrochemical wastewater. The interactive effects of adsorbent dose, solution pH and initial concentration were investigated using RSM and a second order response surface model equation to describe the adsorption of cobalt(II) ions was derived. In terms of the models used in this study, the adsorption process was better described by the Freundlich isotherm model than the Langmuir model. Nonetheless, assessment of the interactive effects of process variables revealed that the system was sensitive to the tested process variables and was deemed technically feasible. Leaching of coal fly ash may potentially result in extraction of some environmental pollutants. The multi-element analysis of the treated wastewater therefore needs to be investigated further in order to determine any available leachates. Moreover, the actual concentration of the leachates must be determined to ascertain if it is below or above the maximum allowable limits. The results presented from this study can help to design an appropriate environmental management strategy to minimise the adverse impacts caused by industrial wastewater contaminated with cobalt(II) ions. We conclude that South African coal fly ash, being a natural, abundant and low-cost adsorbent, might be a suitable local alternative for elimination of cobalt(II) from aqueous solutions. The authors wish to acknowledge Lethabo Power Station (South Africa) for supplying the coal fly ash used in this study.